Why Hasn’t the NFL Threatened to Pull the Super Bowl From Arizona? Roger Goodell has been saying all the right things about the NFL being an open and inclusive environment. Now it’s time to act. Picture it: February 2015, Glendale, Arizona. Michael Goodell, the brother of NFL Commissioner Roger Goodell, is in town for the Super Bowl. Michael Goodell is gay. He has also garnered media attention in recent months by encouraging the NFL to accept and be welcoming of NFL prospect Michael Sam and all players regardless of their sexuality. Michael Goodell attempts to walk into a Glendale coffee shop for a snack on the day before the big game. The owner recognizes him from the recent press coverage, denies him service and tells him to leave. Michael Goodell, used to a red carpet and not a slap in the face, refuses. The owner calls the police and has the commissioner’s brother arrested because his very presence violates the owner’s religious principles and therefore the laws of Arizona. While we all wait for Roger Goodell to say something about this bill, news emerged this week that the NFL is considering Arizona as the future site of the Pro Bowl. In other words, while the nation recoils at Jan Brewer’s pariah state, Roger Goodell—blinders firmly in place—lumbers forward, doing business with a place that should be seen as radioactive. 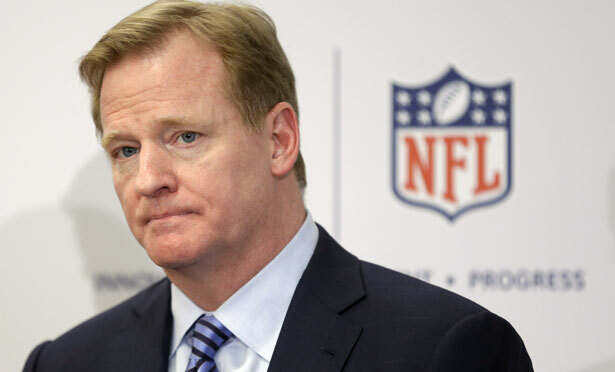 It is time for the commissioner to act even if it hurts the men who pay his obscene $44 million salary. Here we have a league that is trying to project itself as welcoming to players who want to be open and honest about their sexuality. They cannot do that and hold the Super Bowl or the Pro Bowl in a state that proudly projects itself as a bastion of intolerance. They cannot put NFL employees, players and family members in a situation where they would be unsafe. Roger Goodell has said all the right things in recent weeks about the league being an open and inclusive environment. He needs to be told that words, when not matched with deeds, are very cheap. For $44 million a year, one would think he could afford to do better.